Applying enough nitrogen at green-up will be crucial to raising the yield potential from 2 to 4+ tons of DM per acre. Supplying enough spring nitrogen will also increase crude protein from about 14% to nearly 20% DM if the silage is harvested by the boot stage. The application rate of spring nitrogen needed for high yielding, high quality winter small grain silage may range from 0 to nearly 100 lb. per acre depending on the previous crop in the rotation, and the field manure history. Typically rates of 10-20 lb. of nitrogen per acre are applied at planting for wheat that is grown for grain. These rates are also sufficient for small grains grown for silage. 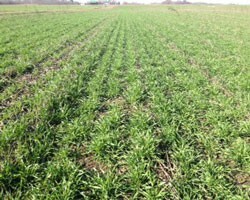 Too much fall nitrogen leads to excess fall growth, leaving the small grains more vulnerable to damage over the winter. One of the most common planting situations for winter grain silage last fall was after corn silage. The amount of spring nitrogen needed will depend on the amount manure applied before planting the small grain. Winter grain silage fields with high manure rates may still respond to a small nitrogen application at green-up (20-30 lb. per acre). If little or no manure was applied at planting than small grain silage yields and quality may respond up to 75-100 lb. of nitrogen per acre. Small grain silage following a haylage field that contained over 50% alfalfa or clover and had at least 6 inches of growth will not require much spring nitrogen fertilizer. Lodging can occur from over fertilization of nitrogen without responses to yield or quality. In these situations farmers may still want to apply 20-30 lb. nitrogen per acre at green-up as the nitrogen from the previous legume will not start to mineralize and become available to the small grain until temperatures increase later in the spring. If fields were mostly grass and didn't receive manure, then at least 75 lb. per acre of nitrogen should be applied. Small grain silage planted after soybeans, field peas, or snap beans will likely to respond to a middle range of nitrogen rates (40-60 lb. per acre) as there will be some legume nitrogen that should be available to the small grain silage. Small grain silage planted after a small grain will likely require between 75 & 100 lb. of nitrogen per acre. Yields of small grain silage following a small grain will likely be lower due to higher disease, insect, and weed pressure compared to the other scenarios described above. If you are growing winter triticale, winter rye, or winter wheat for silage this spring we would like to include your farm in an on-farm research trial that is being conducted this spring in collaboration with Quirine Ketterings at Cornell. We would need an area 100 feet by 100 feet in each field where we would apply rates of nitrogen from 0 to 120 lb. per acre in 30 lb. increments. Prior to green-up we will document field history (January-February), apply the fertilizer at green-up (March-April), take yields at harvest time (May), and then provide you with report comparing your farm to other farms in the study (Fall 2013). We currently have farms in four of the ten counties signed-up and would like to include some more farms from all across western New York. Contact Bill Verbeten if you are interested in joining this study.